The information around the Internet on Sendlane all points to the creator, Jimmy Kim, and his reportedly amazing webinar series on building an email list. In fact, information on his webinar overshadows the company entirely, which is owned by a small group of personal business owners. Together they have over 30 years of experience with Internet marketing, and they claim to know exactly how to help you utilize email to boost your online presence and to grow your business. Looking at Sendlane, it’s easy to understand why a user would be hesitant to join up. They appear to be a newer company, which means they have very few reviews around the Internet. None of the trusted review blogs have picked up on their services yet, and their website lacks detailed information on their founding and development. However, their features list is quite impressive. Full analytics, provided by them, are in place to help you tailor your campaigns to every client’s need. The design of their website is beautiful and easy to use, suggesting that their templates would follow suit. They also offer complete automation, so that you can use your valuable time serving your clients while Sendlane does the hard work for you. Trigger campaigns based on behavior help you increase interaction overall. The most interesting feature listed by Sendlane is the ability to create a business landing page on their website. You can create a home page for your business using their simple drag-and-drop template, and then direct social media followers to the page to read your newsletters and encourage more subscriptions. 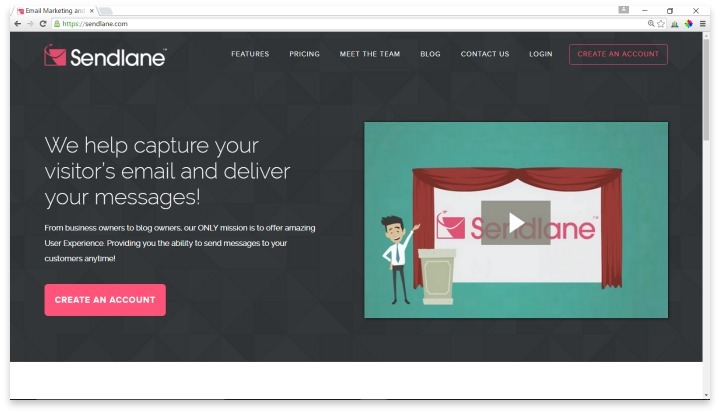 Sendlane’s pricing is roughly the same as other small business-oriented email management services. Their first plan begins at $19 per month for up to 2,500 contacts, and goes up from there. They don’t offer send rate or buy-as-you-go plans, and there doesn’t appear to be a free trial to test it out. Sendlane’s blog is full of tips to help you capitalize on your email list, and help you use brand new marketing trends to grow your business. As you search for Sendlane online, you are often led to creator Jimmy Kim’s webinar series, which appears to be a legitimate educational series that helps you understand how to get more traffic and more subscribers. In any case, it’s a clear sign that the creators of Sendlane are passionate about sharing their knowledge with you so that you can maximize your business. Sendlane creates a customized landing page to lead more subscribers to your business, and provide an easy way to share your message with social media. As promising as Sendline appears on the feature page, the lack of ability to see any of their templates or services without paying first is a major draw back. Without any real user reviews, it’s hard to say whether this new email management service is worth checking out. For only $19, it won’t break the budget if you’re willing to give it a look, and the list of features they do provide is impressive enough to take a peek if you’re tempted. The blog posts make it clear that they are knowledgeable about Internet marketing, and once you’ve uncovered the Support page, the tutorials show a promising user interface that could be right up your alley. Have you had an experience with this company? Please share your Sendlane reviews below.